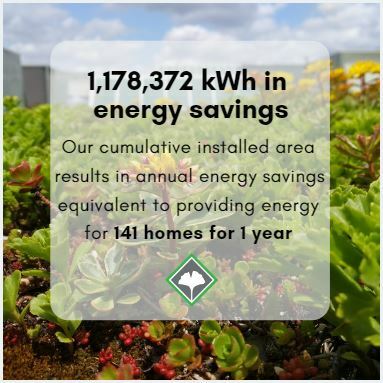 Since 2010, we’ve installed green roofs on 250 buildings, translating to 45 acres, or over 180,000 square meters of green roof area. In downtown Toronto, that’s equivalent to the area bordered Bay St. to the east, York St. to the west, Front St. to the south and Richmond St. to the north. 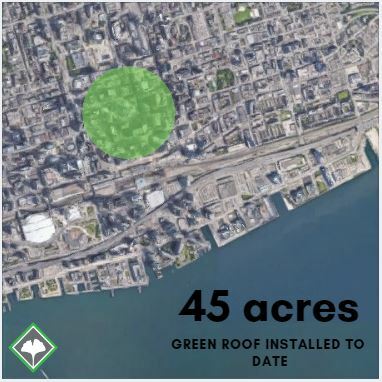 Although most of our installs have been in downtown Toronto (mainly due to municipal green roof bylaw requirements), we’ve installed roofs across Ontario, including in Waterloo, Orillia, Sarnia, and Kingston. 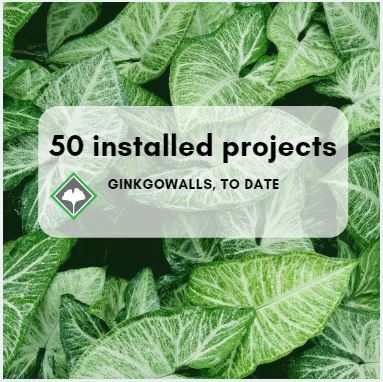 Our living walls division is growing quickly, with 50 completed living wall and Mossart projects since 2014. Our actively maintained green walls span the province of Ontario, and include sites in Toronto, Waterloo and Peterborough. 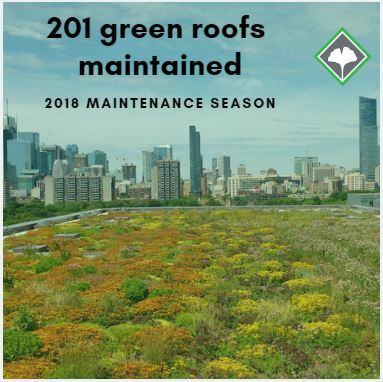 With 201 actively maintained green roofs at the peak of our 2018 season, it was a busy year for Ginkgo’s maintenance team. Our maintained area this season totalled 37 acres or nearly 150,500 square metres of maintained green roofs across the province – roughly the size of Trinity Bellwoods Park in downtown Toronto! Our largest site this year was over 2 acres. *Direct energy savings represent lowered energy demand as a result of improving building insulation and heat flow measures. Calculations are based on methodology used in the 2005 study Environmental Benefits and Costs of Green Roof Technology for the City of Toronto. Conversions are based on standards provided by Environment and Climate Change Canada (Greenhouse Gas and Criteria Air Contaminants Calculator) and the EPA (GHG Equivalencies Calculator).